Slow And Steady: Vinyl Survives : The Record As other formats have come and gone, a small but devoted audience has kept the LP alive. In recent years some headlines have cast an increase in sales for vinyl LPs — once considered a casualty of the CD era — as something like a beacon of hope for the struggling music industry. The reality isn't all that rosy. Though vinyl sales grew by 14% in 2010, according to Nielsen SoundScan, they still counted for less than one percent of the year's total album sales. The music industry has come to view diminished sales expectations as the norm, but vinyl sales barely register compared to those of other formats. Arcade Fire's The Suburbs has sold over half a million copies including sales of CDs and digital downloads. Even the people who service vinyl's small but devoted audience are cautious when describing the format's resurgence. "Vinyl is definitely growing, and will continue to grow. But I think there's a ceiling," says Andres Santo Domingo, the co-founder of the label Mexican Summer. "I don't think it'll ever become the prevalent format. I think it'd be crazy to think that." Still, Santo Domingo and Keith Abrahamsson, his partner at Mexican Summer, started the label as a pop-based vinyl-only sister label to Santo Domingo's Kemado Records, which releases mostly heavy rock and roll. They insist that vinyl's modest sales rates make it a perfect fit for an indie mentality that still wants to function in a digital world. "Operating this way has allowed us to kind of create a much more realistic way to develop artists," Abrahamsson says. "You kind of jump off a cliff the way business used to be done. You just take that risk and see how it works out. Doing a limited press and digital release, you can start to get a gauge on if a release has legs. For instance, the Washed Out record we did, we pressed 1,000 of those and put it out digitally. And we've repressed that like four times now and eventually put it out on CD." Mexican Summer's biggest success story to date — last year's Crazy For You by the group Best Coast — falls right into the current vinyl sweet spot: melodic, retro sounding pop. To date, Crazy For You has sold around 57,000 copies, including 10,000 LPs. Abrahamsson says the small resurgence vinyl has enjoyed lately is easier to understand as a reaction — and a complement — to the options available online. "I think it definitely was a reaction to the mp3, but I think the two of them together make perfect sense," he says. Which is why Mexican Summer — like many other labels that still press their music onto vinyl — packages their LPs with download codes for mp3 versions of the songs on the album. "I think that vinyl in a way represents slow," Santo Domingo adds. "And I think that's something that's attractive about it maybe on a subliminal level for consumers that are maybe on the Internet, to get something that's really physical, maybe archaic in a way, but the complete antithesis of what the speed of consuming music on the Internet is." When it comes to production, vinyl is a little bit of a mystery. We know how CDs, cassettes and mp3s are made and reproduced because we can do all these things at home. Vinyl, not so much. 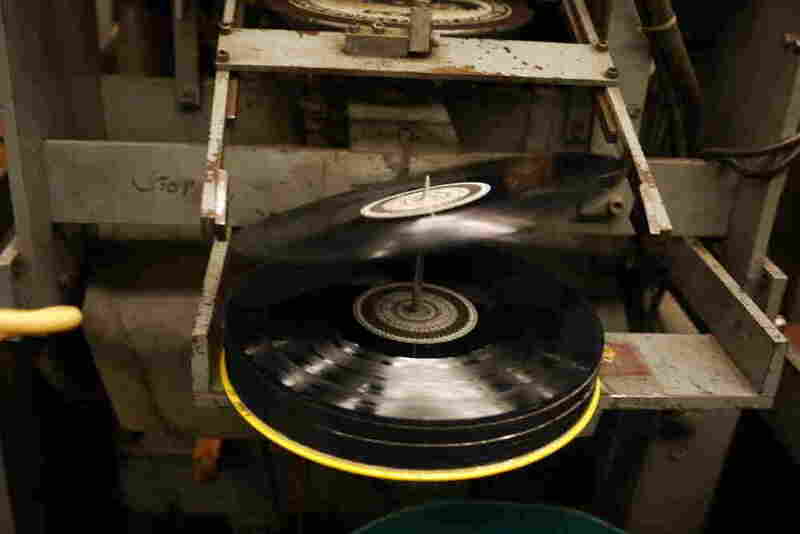 Visiting a plant where vinyl is pressed into records something like stepping back in time. When I met Will Socolov, the owner of EKS Manufacturing, at his vinyl factory in the East New York neighborhood of Brooklyn, the temperatures outside were freezing, but inside without any heat on ("You can't have big fans," Socolov says. "They make dust fly all over the place"), the temperature inside is 76 degrees. EKS makes most of the seven-inch singles released by Mexican Summer, using a process that hasn't changed much in 50 years. The newest press at EKS makes colored specialty vinyl, which begins its life as tiny pellets of polyvinyl chloride in pink, blue, red, green, white or black. 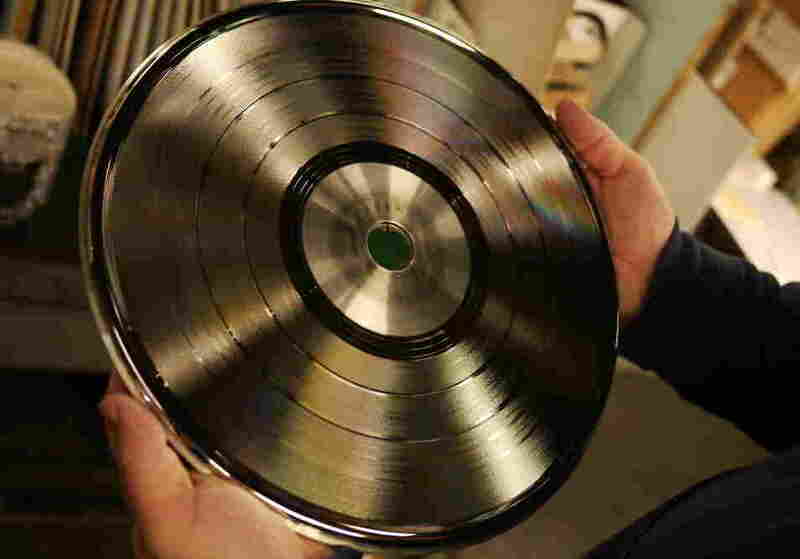 Vinyl records start out as tiny pellets of polyvinyl chloride – PVC – that get melted down and formed into a soft puck-shape, then steam-heated and pressed between the two molds, each with a spiral ridge – negatives of the A and B sides of the record. The whole process takes place inside a single machine that cranks out a full-length 12-inch record every 30 seconds. "Once the steam is done, cold water goes in and cools the record," he says. "Once the record is cool, the press opens back up again, the record is then gripped and moved forward. The record is then trimmed and tipped over onto the spindle, and while that's happening, the next record's being made." Socolov has been part of the New York City music scene since disco and punk were mixing in clubs downtown. Some of the machines at EKS have been around nearly twice that long, and nobody make them any more, which means that when something breaks, Socolov has two choices: get a new part specially made, or cannibalize an old machine. 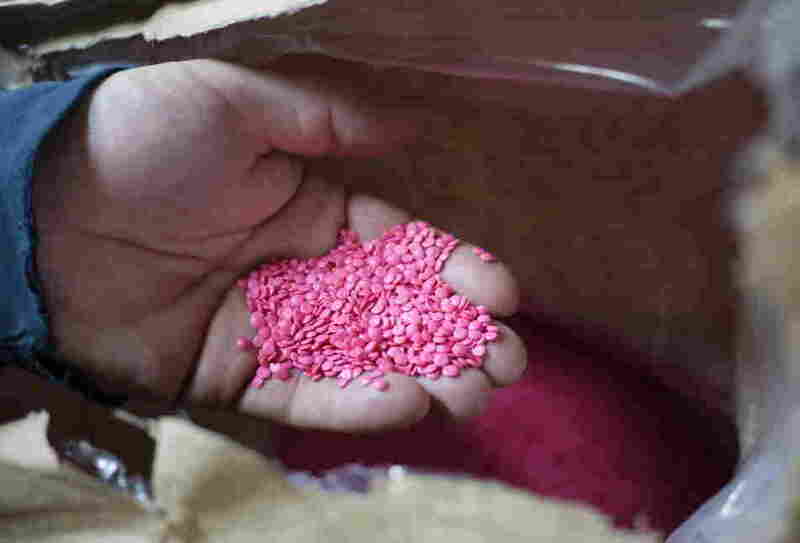 "I know pressing plants that have gone out of business that people have bought not to get the presses," he says. "They bought it to get the parts." Not that there are many plants left to raid. 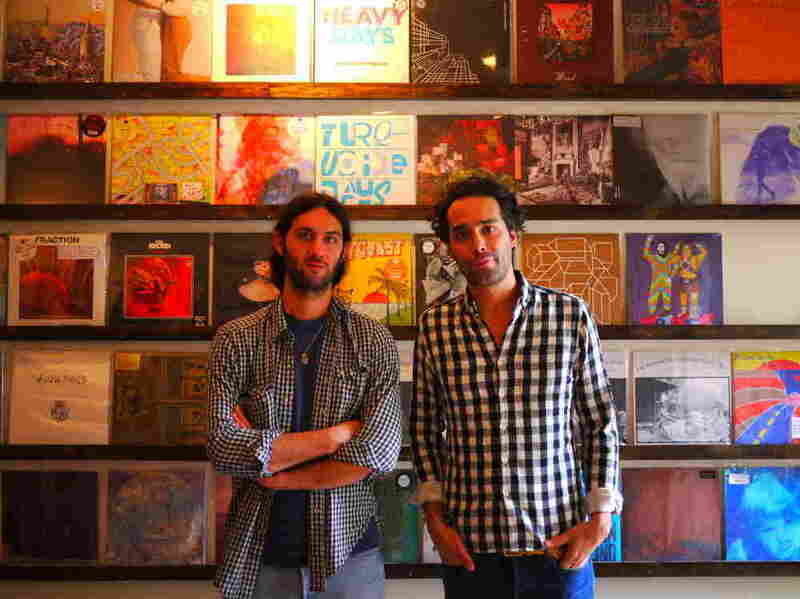 "In the old days, there used to be 40, 50 pressing plants in New York area. Now there's three. I'm one of three." The contraction, Socolov says, started with the introduction of the CD, but through that era, one group kept the pressing plants in business: DJs who played dance music and hip hop on the radio and in clubs. Alain Macklovitch better known as A-Trak, was born in 1982, the same year the CD was introduced. He started DJing when he was 12, and won the world DJ championship when he was 15. "What I fell in love with was scratching," Macklovitch says. "Physically manipulating these pieces of vinyl, moving the record back and forth and making these crazy sound effects with it. So there's a tactile connection with the record." But along with the close physical relationship, the format had some drawbacks. Vinyl is expensive. It's heavy. Records can scratch or break. Macklovitch winces as he recalls times that airlines lost crates of his records. So about a decade ago, when software companies started introducing programs that allowed DJs to replace their crates of vinyl with digital files stored on laptops, all those drawbacks vanished. Macklovitch was an early tester of Scratch Live, probably the most widely used "vinyl emulation software," and better known as Serato, the name of the company that makes it. Macklovitch says that at first, it took some time to get used reading file names off a computer instead of flipping through a crate to find your next record. But once he made the transition, there was no going back. "Suddenly, when you had Serato and you had every song that you owned with you at all times, you could just sense a kind of tangent that your set could go into and just play it," Macklovitch says. But he hasn't abandoned vinyl entirely. Today he owns the record label Fool's Gold, which has about 50 hip hop and electronic music releases under its belt — nearly all on vinyl. This despite the fact that the format is a challenge to produce, and expensive, and success on even a modest scale is limited. So how has vinyl managed to stick around at all? "It looks better. It sounds better. You can hold it in your hand. It's a keepsake that you can hold in your hand and treasure for years," says Jenn Wasner, the singer and guitarist for the Baltimore-based duo Wye Oak. Wasner and her bandmate Andy Stack are exactly the kind of audience that vinyl-selling labels want. Devoted listeners who appreciate the convenience of mp3s and view CDs as devices to deliver digital files onto a computer, but want to hold onto the notion that music can be attached to a physical format. When the pair recorded their debut album in 2006, they self-released it at first, making 1,000 copies on CD, simply because it was the default format. "We didn't even think about vinyl at the time, because it was cost-prohibitive," Stack says. But then the band was signed by Merge Records, one of the country's most successful indie labels. Merge didn't put Wye Oak's first album out on vinyl. Or its second. Stack says the band started to push back. "Over the years we've been like, 'Guys come on. Give us vinyl.' We work so hard. We want our music represented this way." Stack and Wasner say they've always understood the label's decision from a financial point of view. But that won't make it any less sweet next week when the band's third album, Civilian, comes out in three formats: digital download, CD, and vinyl LP. "I always have said to people who have asked that I'll never really feel like a real band until I can hold a record in my hands and look at it," Wasner says. "I'm really happy to say I'll be able to do that really soon."